2/10/2016Share this story on Facebook! 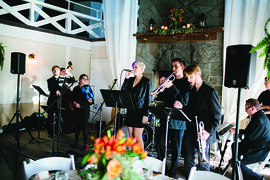 Students in the Wedding Band class perform at a Lakewatch Inn wedding celebration. Photo by Craig Griffin Photography. Students who enroll in Wedding Band learn to arrange music that is requested by the couple getting married as well as songs that the students select to perform. Other skills students learn through this course include improvising, composing, transcribing, and transposing music for live performance and recording, as well as business experience working with a client. For students taking a new course offered in the School of Music called Wedding Band, the venue for their midterm exam was not a typical classroom. The midterm was held at Lake Watch Inn during the wedding reception of Rich Anderson and Brad Marzolf. Professor Mike Titlebaum’s Wedding Band class was offered for the first time in the fall 2015 semester. Nine undergraduate musicians—with instruments including voice, trumpet, guitar, violin, and drums—signed up for the class. Titlebaum’s impetus for the Wedding Band class was twofold: to continue students’ high-caliber musical development and to show them yet another way to make a career in music. After months of planning and rehearsing, the big day—that is, midterm exam day—came. On October 10, the students performed at Anderson and Marzolf’s wedding. Feedback about the students’ performance was even factored into their grades. Marzolf and Anderson gave the students a resounding A+.